Freemium gaming is definitely the highest common denominator when it comes to iOS games nowadays. Free to play titles with premium paid-for elements are the real big-money spinners on mobile devices and developers know it. A few years ago, who would have though that you could make money by giving your games away for free? 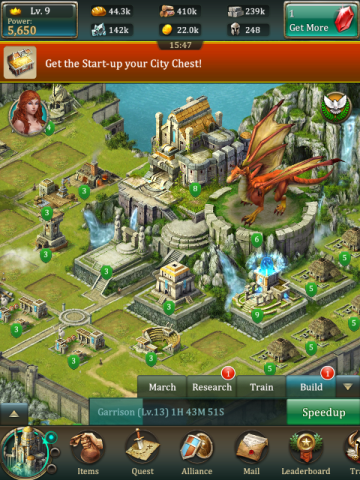 Dragons of Atlantis began life as a free-to-play browser game, allowing gamers to enter the fabled Lost City of Atlantis, and try to rebuild the empire – with the help of Dragons that you could hatch from an egg and raise to become the protector of your city. The game is basically a resource management title, with some standard war-gaming elements thrown in for good measure – and as the game is focused quite heavily on improving and levelling-up your city, there is a lot of scope for paid-for premium extras. 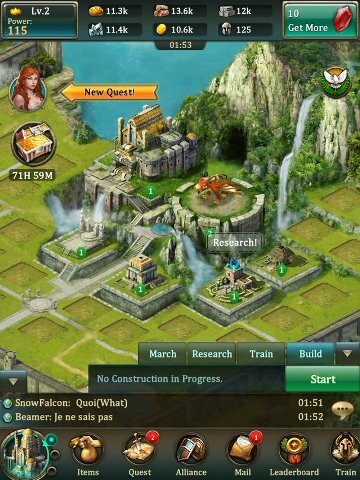 The freemium factors therefore involve buying extra gold and other resources – or buying buffs that can grant limited time bonuses or special skills – to make your general gameplay and building times quicker. 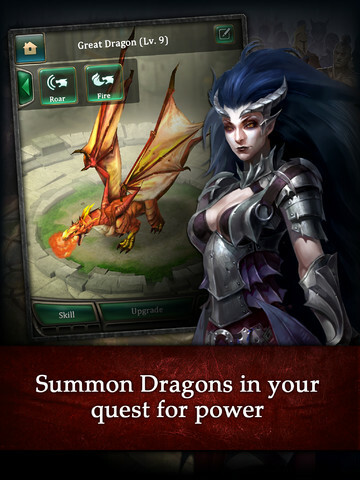 The game must have seemed like a good match for a release on iOS devices, and a slightly reworked version of the game – subtitled Heirs of the Dragon – has made its way to the small screens of Apple hardware. The game remains more or less unchanged from its original incarnation, so fans of the series will feel quite at home. I should start by saying that despite the fact that Dragons is largely a single-player experience – with Leaderboards and Alliances (players grouping together to share strength and resources) being your only real interaction with other players – the game requires a data connection of some description at all times. For a genre such as city management that is regarded as one of the true single-player games, the need to always be online is quite a shame. Ok, social interaction such as chat and sharing is encouraged, and you might want to call on your allies for help, but the gameplay remains largely a solitary experience – so why must we always be connected online? It makes no sense. The storyline is pretty thin, to say the least. After the fall of Atlantis, the humans escaped. They have now returned to rebuild their city, but find that that Anthropus – an Orc-like race who used to serve the humans in the past – have taken over Atlantis, killing all who opposed them. You must build up your city, your resources and your armies in order to re-claim the lands, and defeat the leader of the enemies, Grodz. To help you in your quest, you find a Dragon egg which you can hatch and then raise to join your fight. Through levelling up and training your Dragon, you can make it a deadly war machine that will help you conquer Atlantis once again. Everything such as levelling up your dragon, building an army or even growing your population is reliant on resources. You start with a healthy compliment of each: wood, stone, metal, gold and food, but must quickly build your city and infrastructure in order to produce more of these elements. If you don’t, you will soon find that you cannot build or develop your city in any way. 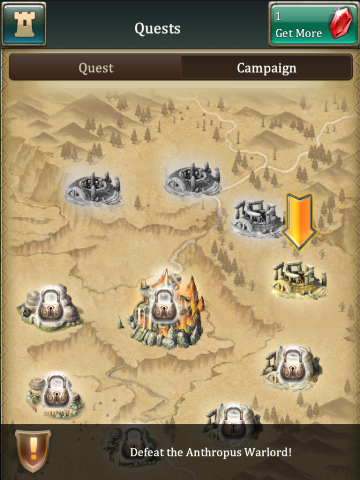 Luckily, the game starts with an extended tutorial made up of a series of many short quests or objectives. These can be as simple as “build a farm”, or more complex such as head out onto the battlefield and defeat an Anthropus warlord – and you are rewarded accordingly. The game begins like a fantasy Sim City, and the tutorial helps a lot in learning the ropes. As you get further into the game, you may want to conquer surrounding locations on the map, or attempt the thin campaign mode where you fight against Anthropus camps of increasing difficulty until you rid the land of their scourge. There is some minor plot development here via your Advisers, but it is minimal, and the story won’t grip you – the development and advancement of your city is what keeps you coming back. Defeat warlords and you can unlock armour for your Dragon – in turn reinforcing your army and allowing you to defeat harder enemies. The game is all about moving up to the next level, whether it be farming, science or battles. Sadly, the warring doesn’t really involve the player; they simply choose who to send into battle and wait for a result, be it positive or negative. It would have been nicer to have a little more input into what happens on the battlefield. Touch screen controls are obviously used for everything in-game, and for the most part they are intuitive. 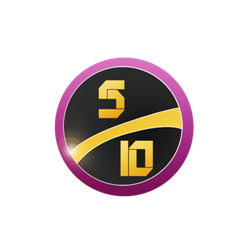 You will have to pick where to build your farms and mines, for example, by zooming in and out of the maps, which can be performed by pinching or using on-screen buttons. You navigate all of the upgrade menus and battlefields by dragging and tapping, and all of this works pretty accurately – but the war map is a little particular and won’t always let you select the area you wish to correctly. There are also some sliders used for setting tax rates and troop numbers which are difficult to use accurately with touch – these really needed fine-tuning buttons to help reach an exact number. The artwork in the game is all quite detailed, with the buildings you erect developing and evolving in appearance the more you level them up. Unfortunately, they haven’t been up-scaled much from the iPhone and iPod version for the iPad, so on the bigger screen the fidelity does suffer somewhat. The music is pretty much your standard fantasy fare, and the sound design in general ends up being a little forgettable – but this factor is unlikely to have much of an impact on whether you enjoy the game or not. This title is all about the gameplay, and there is plenty of that. There is no real end-game as such, you just keep playing for as long as you like, tweaking and altering things to get your resources working effectively until you are satisfied one way or another. VERDICT: Dragons of Atlantis: Heirs of the Dragon certainly won’t appeal to everyone. The presentation won’t wow you, the story won’t thrill you and the characterisation is paper-thin. But if you enjoy juggling your resources, plotting and organising your army, and have a slight lean towards obsessive compulsiveness, you may find that Dragons of Atlantis provides a long-term gameplay experience. Strangely hampered by its insistence on being always linked to its social aspects, the title would have worked just fine as an entirely offline title. The controls perhaps needed a little more thought, too, as frustration due to the touch-screen imprecision can set in. Given that the battles seem like something of an afterthought and aren’t well integrated with the city management gameplay, the package does end up feeling a little uneven. As a straight strategy title it does an admirable job, but the elements that are supposed to make it stand out end up falling flat. Dragons of AtlantisHeirs of the DragonKabam Inc.